At the 11th hour of the 11th day of the 11th month, we will remember them. On 11h00 on 11 November 1918 the cease fire went into effect, bringing The Great War to an end. That occasion is remembered with two minutes silence ever year at the same time. It was a tradition that began in Cape Town. On the closest Sunday to 11 November each year a Remembrance Day Parade is held in Cape Town. The two minutes of silence begins and ends with a cannon salvo. After a short religious service and an address by the guest of honour the Last Post is played and the national flag is lowered. After two minutes silence Reveille is sounded and the national flag raised. This year the religious service was given by Chaplain Rev Andrew Treu and Sheik Abdullah Abrahams. Deputy Mayor Aldreman Ian Neilson was the guest speaker. 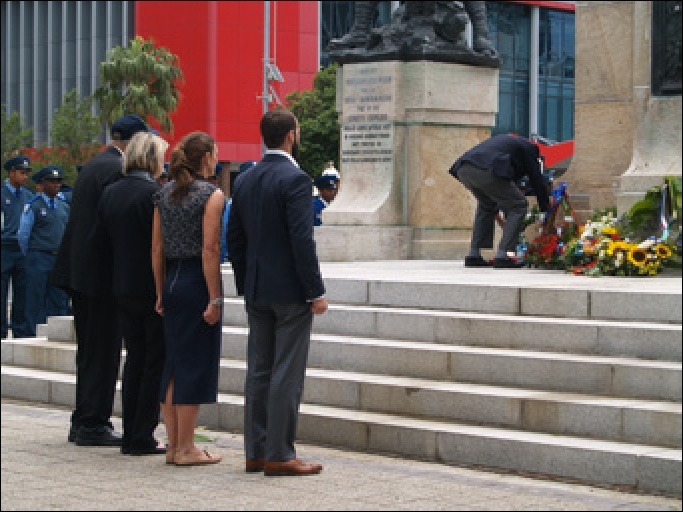 Wreaths were laid by a number of organisations, associations and individuals. Two of the remaining members of 3 Signal Company Reunion Association, Charles Holloway and Syd Ireland, were among those to lay wreaths. Charles was accompanied by his daughter as well as his granddaughter and her new husband. She is a captain in the Australian Army while he is a captain in the American Army. 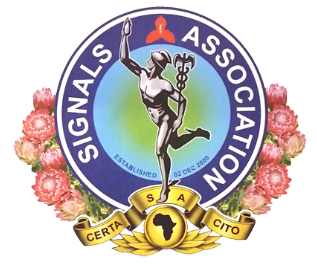 The Signals Association also laid a wreath and a number of members of the Signals Association attended the parade. 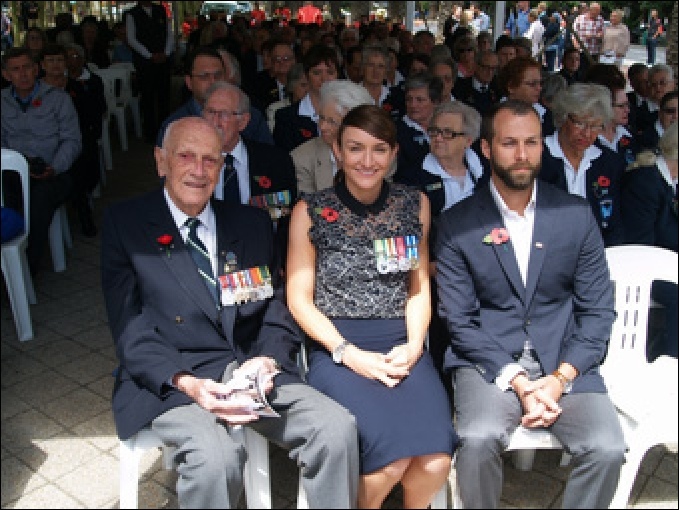 Charles Holloway lays a wreath during the 2016 Remembrance Day Parade in Cape Town while his daughter, granddaughter, grandson in law, and Syd Ireland watch. 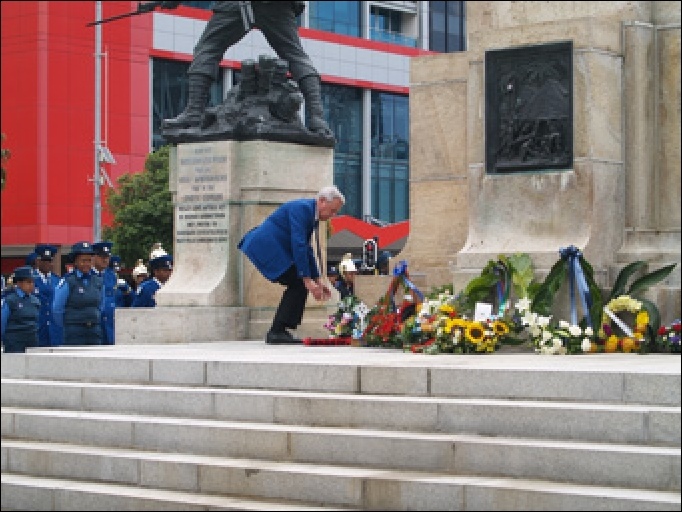 A wreath is laid on behalf of the Signals Association by Manco member Willie van der Merwe. Charles Holloway sits with his granddaughter and her new husband. She is a captain in the Australian Army while he is a captain in the American Army. They both served in Afghanistan.